In life, my two favourite colours are turquoise and coral. I love them so much that when in the Fossil outlet shop in New York last year, I found myself standing in the shop in a panic, holding two handbags, one turquoise, one coral and I couldn't decide which one to get. So I got them both. And the matching purses. I know. Madness, but I love them. 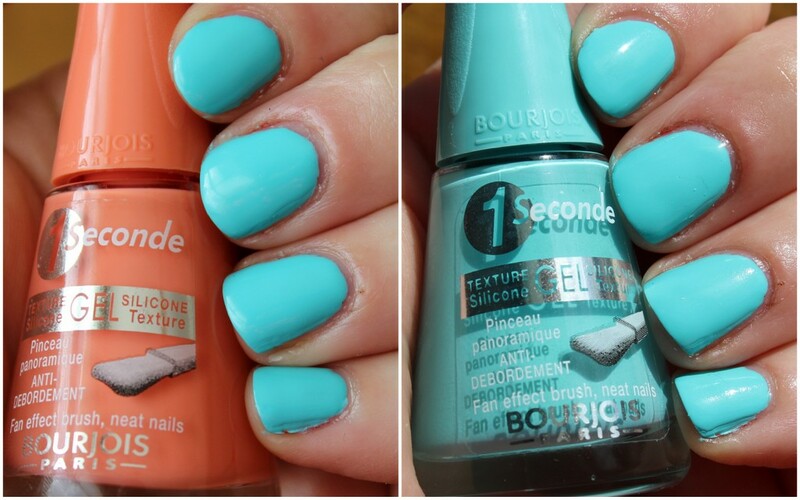 So imagine my ultimate excitement when I saw that Bourjois had these two shades as part of the summer nail collection. Say hi to Blue No Blues and Meli Melon. 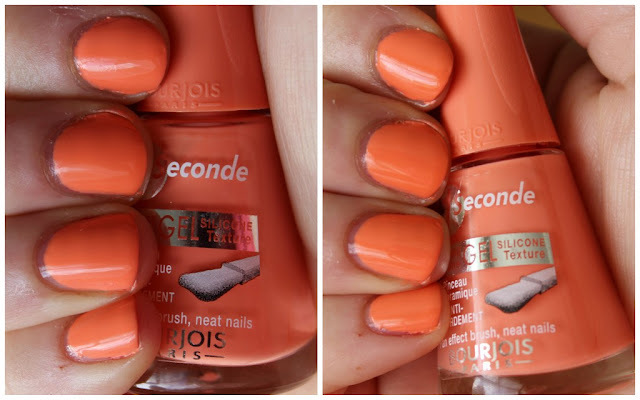 Part of the 1 Seconde Nail Polish range, these two shades were made for me, whether Bourjois know it or not. There's a mint green and a sunny yellow shade that I reviewed recently and they make up the summer quartet. And although these were given to me, I 100% know I would have bought them myself. Blue No Blues is quite possibly the most gorgeously bright, vivid turquoise polish to have ever been plonked upon my nails. I can't express how much I love it other than repeating the words "I love it" over and over again, but that wouldn't make much of a review. The photos show two coats and you can see how opaque it is. Application is a doddle with the wide brush and as long as I don't load up the brush with too much polish, I can coat my nail in one swipe, drying to a glossy finish. The two shades work so well together and I think I might have to do a bit of nail art with the two of them as I am wild and have too much time on my hands obviously. But looooook! Beautiful contrast! Meli Melon looks more orange in these photos but in real life, is more coral. This shade took three coats to be fully opaque but is worth the extra coat when it's done. Meli Melon is one of those shades that comes to life in the sun and so I would like it to be sunny every day thanks very much. When I was taking photos these polishes over the weekend, I put one colour on each hand. Then left them on. I didn't want to take them off but couldn't decide which one I preferred. I even went to town yesterday with one shade on each hand and wore them proudly! 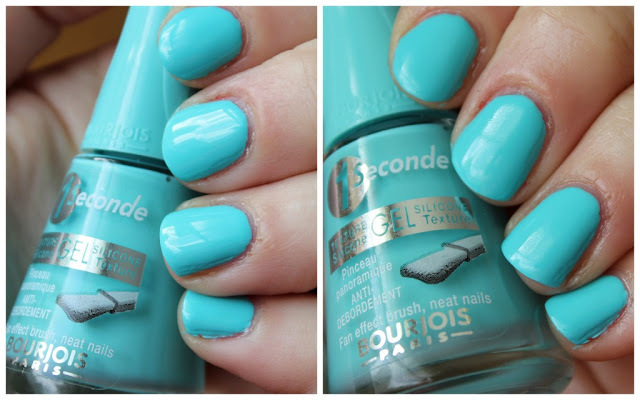 Blue No Blues and Meli Melon should be on counters now and are €7.99 and are so beautiful! They're going to be seen on my nails a lot this summer! Wow… they are stunning.. The blue colour is looking very gorgeous..
Oh these are pretty! 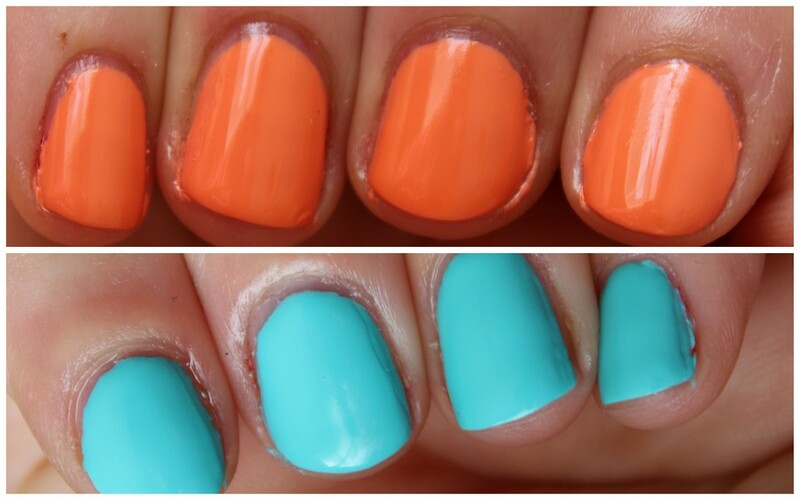 I could easily imagine wearing Blue No Blues on my toes and Meli Melon on my fingers! 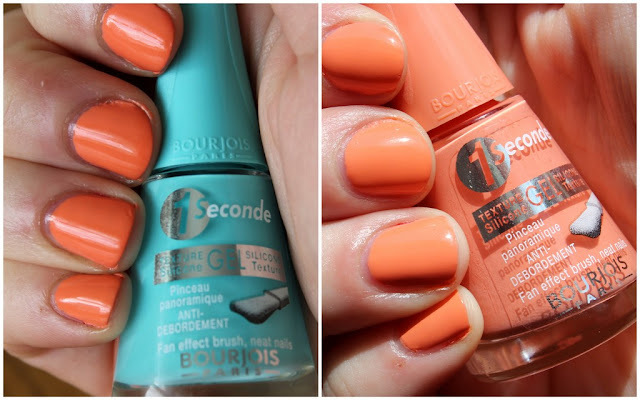 They're lovely, I never remember that Bourjois do polish!! Love love love the turquoise polish, it is the most perfect shade and so bright. Got mine a few months ago. The brush of these polishes is also a delight to work with.